When you look out the window at a tree or hold a fragrant bouquet in your hands, how does it make you feel? Do you feel peaceful or filled with joy? If so, you might agree plants have the power to heal. Science proves interacting with plants, both indoors and outdoors, is beneficial to physical and mental health. Anyone of any age and skill level can enjoy the benefits of gardening and surrounding him- or herself with nature. In this post, we’ll explore reasons to bring plants into your or your child’s life. We’ll also talk about horticultural therapy and how it fosters growth, healing and self-understanding. Plants boost physical health in several different ways. For example, you can help purify the air and add calmness to the environment merely by adding a single plant to a room. Here are the top reasons to welcome plants into your home, yard or community. Indoor plants look gorgeous in any office, classroom or home, and they also help clean the air. According to an article published in “Water, Air and Soil Pollution,” the majority of urban residents spend their time indoors, where air pollution can be several times higher than outdoors. Indoor air pollution can lead to sick building syndrome, which includes symptoms such as headache, dizziness, loss of concentration and throat irritation. Scientists have identified over 300 toxins in indoor air called volatile organic compounds, which indoor plants help remove. For example, according to this article, plants removed high doses of benzene from the air within 24 hours. Outdoor plants also reduce air pollution. The majority of American adults and children do not get enough exercise. Lack of exercise can lead to a range of health issues, from heart disease to depression. The Physical Activity Guidelines for Americans recommend children and adolescents get 60 minutes or more of moderate to vigorous exercise every day. Adults should aim to get at least 150 minutes of moderate-intensity exercise a week. By getting adequate exercise, adults and children reduce their risk of heart disease, cancer, diabetes, anxiety and depression. 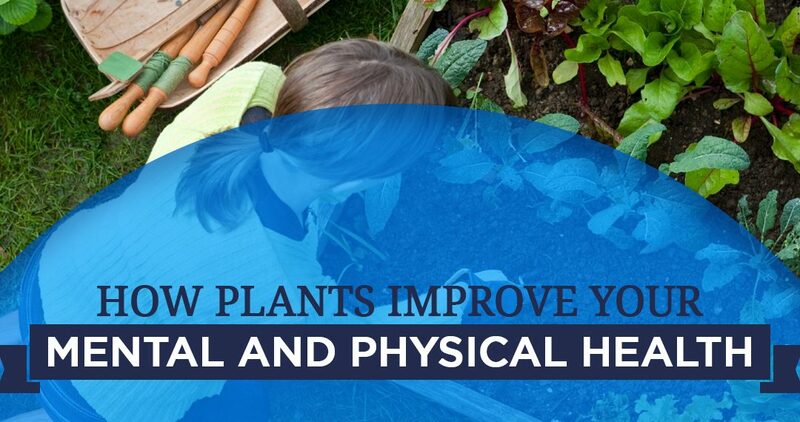 Working with plants helps individuals get the physical activity they need to stay in shape or improve their current condition. Gardening is a fun and easy way to incorporate exercise into your or your child’s daily routine. Children usually enjoy working with soil and learning about plants. A child may not even notice they are exercising while they dig, move soil or water plants in the sunshine and fresh air. Gardening also helps children develop motor skills and overall strength, and it can even combat childhood obesity. For example, according to Harvard Medical School, just a half hour of general gardening activities burns 135 calories for a 125-pound person. It can feel difficult to get the recommended amount of fruits and vegetables every day, especially for those who do not prefer the taste of these foods. According to the Centers for Disease Control and Prevention (CDC), most Americans do not eat enough fruits and vegetables. For example, only one in 10 adults eats the recommended amount of fruits or vegetables every day. Gardening encourages individuals to add healthy foods to their diets and break free of poor eating habits. Children and adults will feel better all around when they enjoy nutritious foods every day. Children and parents can choose the foods they wish to grow, and they don’t have to worry about pesticides. Homegrown food tastes better and is more appealing because of the time and effort it requires to grow and harvest. Children can easily grow delicious cherry tomatoes, zucchini, radishes and flavorful herbs — just to name a few. A child will likely feel excited to eat what they grew. According to Saint Louis University research, when families grow food, they create a positive food environment. Children served homegrown food are more than twice as likely to eat five servings of vegetables and fruits a day than those who do not or rarely eat homegrown produce. Children who eat homegrown food also prefer the taste of fruits and vegetables to other foods. Gardening and growing produce is a simple way to encourage children and adults to get the nutrients they need for physical and mental health. Indoor plants increase the comfort levels in rooms and decrease the risk of getting sick. For example, a study from Washington State University found plants reduced dust in rooms by as much as 20 percent. The study confirms plants can successfully remove particulate matter from the air. The study also suggests plants may help add humidity to a room. As a result, people in a room with plants may experience less dry, dusty air than rooms without. Greenery helps reduce the risk of irritated airways, runny noses and itchy eyes. Studies have also found a connection between indoor plants and mental health, including aiding the healing process for hospital patients. For example, a 2009 study found patients in hospital rooms with plants and flowers had lower blood pressure, higher pain tolerance, lower anxiety and lower fatigue than patients who stayed in rooms without plants. This study supports the therapeutic value of plants. Interacting with nature is essential to maintaining a sense of well-being. Through gardening and spending time around plants, individuals can reap a wide range of psychological benefits. Here are just a few mental health benefits of being around indoor plants and gardening. Human beings generally feel happier and more optimistic in surroundings with plenty of plants and nature. Consider a survey conducted at four San Francisco Bay Area hospitals. In the survey, 79 percent of patients said they felt more relaxed and calm, 19 percent felt more positive, and 25 percent felt refreshed and stronger after spending time in a garden. Flowers also evoke positive emotions. For example, in a 2005 study, women who received flowers reported more positive moods three days later. Elderly patients who received flowers also reported brighter moods and improved episodic memory. While you may only need to place a plant on the windowsill at home to help create a more soothing environment, you can increase happy feelings even more through gardening. Gardening reminds us of our connection to nature, and helps us focus on the bigger picture, which can alleviate symptoms of depression. Also, the physical aspect of gardening releases feel-good chemicals in the brain such as serotonin and dopamine. Finally, working with soil makes us happier. A 2007 study found a bacterium in soil called Mycobacterium vaccae triggers the release of serotonin, which lifts mood and reduces anxiety. Looking at plants and flowers, whether indoors or outdoors, is a peaceful activity free of worries or conflict. It encourages living in the present moment and engages the senses. When you take time to smell the sweet perfume of a magnolia tree, for example, your cortisol levels drop. Consider a study published in the “Journal of Physiological Anthropology.” In this study, one group of participants worked on computer tasks, while another group transplanted indoor plants. After completing their assignments, the groups switched. The researchers found the subjects felt more comfortable and relaxed after the transplanting task, rather than the computer task. The study concluded individuals could reduce psychological and psychological stress by interacting with plants. Another study, published in the “Journal of Health Psychology,” compared the effects of outdoor gardening to indoor reading. The study reveals both gardening and reading decrease cortisol levels. However, stress levels decrease significantly more with gardening. Likewise, the study participants enjoyed a fully restored positive mood after gardening. Gardening and being around plants strengthens attention span, which can aid concentration and learning. For example, a study published in the “American Journal of Public Health” examines the impact of green or natural settings on children with attention deficit hyperactivity disorder (ADHD). Researchers found activities carried out in green settings significantly reduce symptoms of ADHD compared to other settings. Many children can benefit from spending time in nature. According to the CDC, an estimated 6.1 million children in the U.S. have received an ADHD diagnosis. Gardening also helps children to achieve academically. A study published by the American Society for Horticultural Science demonstrates the impact of gardening activities as part of a science curriculum. Students who gardened scored significantly higher on a science achievement test than students who studied science in a traditional classroom setting. Low self-esteem is a common experience among adolescents and young adults. It’s normal for teens to compare themselves to others on social media or feel pressured to look or act a certain way. Children and young adults can benefit from taking technology breaks and heading outdoors. Gardening is one way to generate excitement about connecting with nature and the world outside. When children take care of plants and watch plants grow, they observe a transformation. A child can gain an understanding of his or her transformation from child to young adult. Children can also learn it does not matter what they look like or if they have a mental health issue — they can be nurturers and contribute their love and attention to the world. Gardening is one way to gain a sense of self-worth regardless of social pressure. Lastly, any gardener feels proud when it’s time to harvest the beautiful produce. Children can enjoy the taste of the vegetables they grew or the sight of the colorful flowers from their garden and the confidence boost that comes with it. At Hillside, we’re happy to provide a form of therapy utilizing plants to help children experience mindfulness and the positive mental and physical benefits of plants on mental health. If you’d like to explore this as a treatment option for your child or teen, contact us to learn more.